The JNR framework serves as a comprehensive carbon accounting and verification platform for jurisdictions to guide development of their REDD+ programs and help nest REDD+ projects and subnational jurisdictions within these programs. JNR is the only global, jurisdiction-level REDD+ framework that is rigorous enough to meet the needs of market-based mechanisms around the world, such as the California cap-and-trade program. JNR was specifically designed to facilitate private investment in REDD+ at multiple scales, and is therefore well-aligned with the Paris Agreement’s objectives of engaging the private sector, while linking to national efforts, as well as potentially providing emission reductions to emerging markets, such as the ICAO Market Based Mechanism (MBM) for the aviation industry. Nearly all REDD+ projects globally use the VCS Program to quantify and credit their carbon benefits, facilitating their integration within JNR programs. Similar to VCS projects, proponents may also choose to develop their REDD+ programs in a phased approach, for example, by including additional activities or carbon pools, and using more advanced methods for baseline setting and monitoring over time. JNR is a practical, flexible and consistent framework that ensures JNR programs maintain environmental integrity and jurisdictional sovereignty. This webpage will soon be updated to reflect post-Paris changes and opportunities for forest carbon projects and programs. 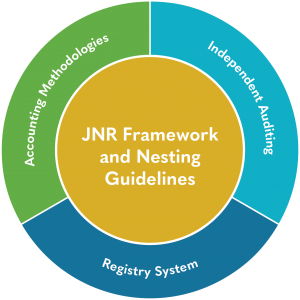 JNR Framework and Nesting Guidelines: JNR provides robust and transparent accounting and verification approaches for the integration and scaling up of government-led and project-level REDD+ activities. Accounting Methodologies: The JNR framework includes tools like the JNR Non-Permanence Risk Tool and the JNR Leakage Tool, which provide robust approaches to implementing JNR programs while managing non-permanence risk and minimizing and deducting any leakage. Independent Auditing: JNR programs seeking to issue VCUs must follow the validation and verification assessment process, including an audit by an accredited, independent third party and expert panel. National and subnational REDD+ programs using JNR as guidance (eg, on how to handle nesting of project activities) without seeking VCU issuance do not need to undergo validation or verification. 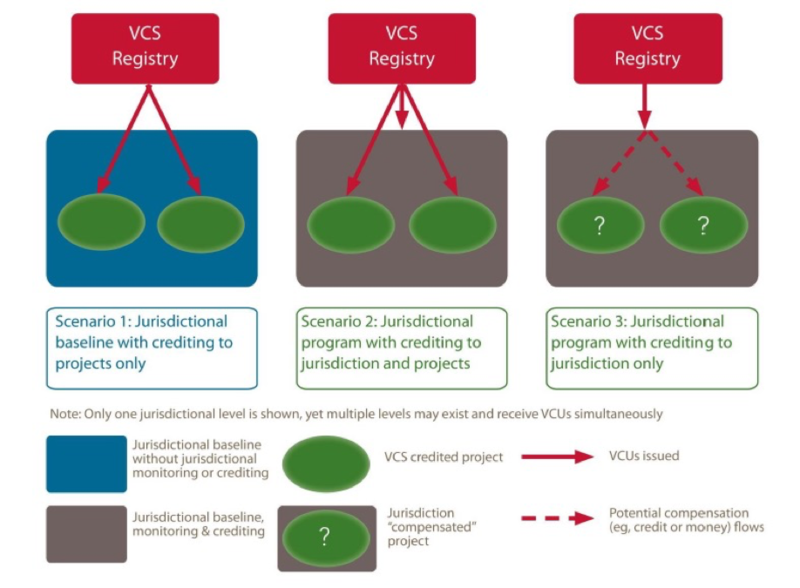 Registry System: JNR programs use the VCS Program Registry to register and issue VCUs, and manage their contributions to the non-permanence risk buffer. Those not seeking VCUs, or seeking a combination of VCUs and results-based payments (e.g., from FCPF or bilateral agreements) may also leverage the VCS Program registry system – providing a platform for tracking emission reductions and managing buffer contributions for the entire program. The VCS Program registry system also provides a clear link between jurisdictional programs and any nested projects in the jurisdiction, providing a clear mechanism to prevent double counting and ensure emission reductions within the jurisdiction add up. Meeting UNFCCC requirements with JNR. A gap assessment was completed by Winrock International in December2014 comparing the World Bank’s Forest Carbon Partnership Facility (FCPF) Methodological Framework (MF), the UNFCCC REDD+ Rulebook and the VCS JNR Requirements. The report concludes that jurisdictions successfully applying JNR will automatically satisfy the vast majority of the MF indicators and the UNFCCC requirements, with no or minimal additional effort. The Summary of Findings section of the report is also available in Spanish. Under JNR there are three potential scenarios for nesting projects (or subnational jurisdictions), as illustrated below. The choice of scenario will depend on the goals of the jurisdictional program and the needs and interests of project developers and investors. The Jurisdictional and Nested REDD+ (JNR) framework was released in October 2012. 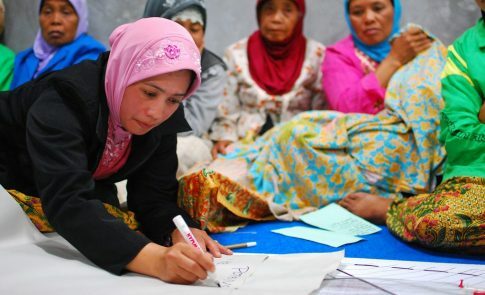 The JNR framework was developed with input from committees of government, civil society and private sector leaders from 14 countries and six continents. Verra thanks the Climate and Land Use Alliance (CLUA) for their generous support in the development of the JNR framework, and the Norwegian government for their support to piloting the JNR framework under the NICFI funding stream. 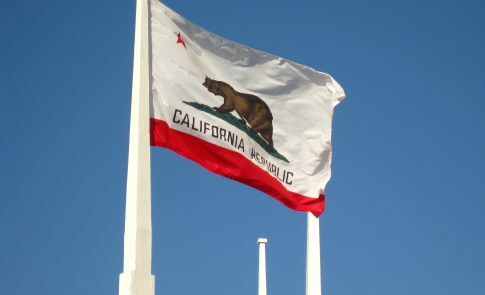 May 2012: Draft VCS Standard (PDF) and Program Definitions (PDF). New requirements and definitions are highlighted in red.